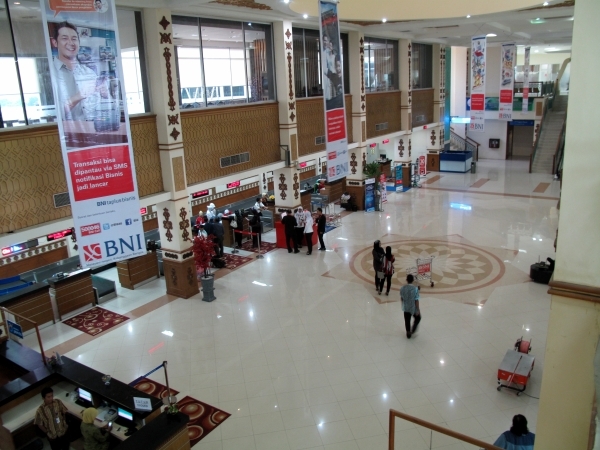 The main departure hall of Banda Aceh airport. Banda Aceh's small airport primarily hosts domestic traffic from other parts of Indonesia, especially Jakarta and Medan. International connections are to Penang and Kuala Lumpur. The airport was extensively renovated after the tsunami, with an extended runway that can accommodate large aircraft, such as Boeing 747. However, the terminal is relatively small, with just two jetways. As with all Indonesian airports, those traveling into or out of Banda Aceh are strongly encouraged to lock their luggage. Pilferage from checked bags has been a problem at most Indonesian airports. Also note that the ICAO liquids, aerosols and gels rule applies to all carry-on bags for all departures from this airport. For ideas about what to see and do around the city, see the Asia for Visitors guide to Banda Aceh.